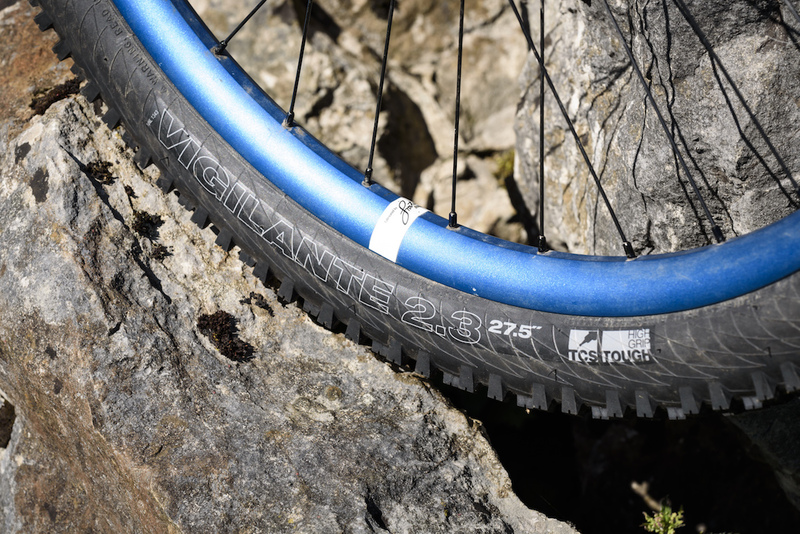 Billed as WTB’s premier enduro tyre for big mountains and mixed conditions, the Vigilante is available in two casings (Light and Tough) and two compounds (Fast Rolling and High Grip). 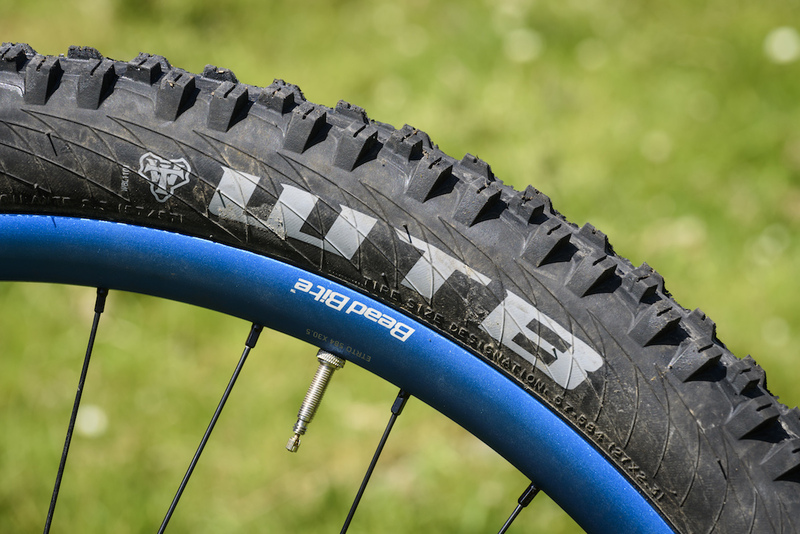 All versions feature the Tubeless Compatible System; a UST-licensed bead system designed to ideally hook up with WTB’s own TCS rims to provide seamless tubeless compatibility. However, the tyres are also designed to seal tubeless with other tubeless compatible rims on the market. Compared to some uber-soft dual compound tyres, the dual compound (60a base/45a outer) rubber found on the High Grip model, is towards the harder end of the spectrum, but this makes for a longer lasting trail tyre that is likely to appeal to a broader range of riders rather than those looking for just flat-out grip. We’ve been riding the Tough, High Grip version (previously labeled Team), and it’s a reassuringly solid tyre. It features a dual ply 60tpi casing, durable sidewalls, and a big, open and chunky tread that makes for a very purposeful looking tyre in spite of its relatively narrow, 2.3in width. It’s also one of the heaviest tyres on test, coming in at a claimed weight of 1140g. That’s close to a full-blown downhill tyre! WTB has a wide range of tyres, with multiple options in casings and rubber compounds depending on your needs. For install, the Vigilantes needed a blast from a compressor and an extra roll of tape to go up tubeless on some rims (Hope Tech Enduro and WTB Frequency i25 TCS), and they were an utter pain to remove. While this may be something you could blame on the extra tape, later on in the test we were able to hand fit/hand remove (and seat with just a track pump) the other tires on test on the same rims. 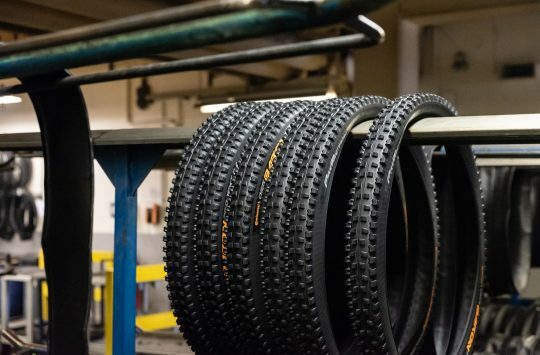 Our experience of WTB tyres in the past is that they do have a reputation for being a tight fit though, and while this is frustrating, the extra security does mean they’re less likely to burp off the rim at lower pressures. Designed to excel in looser conditions, the Vigilantes dug in relatively well in the slop and loam of our local woods as well as during forays into the off piste tracks around Glentress, but were fairly sketchy on the damp rocks of Innerleithens red and black graded trails. Cornering grip on the front was ok, but nothing outstanding and the rounded tread pattern didn’t inspire us with the confidence to really heave the bike over into turns – there wasn’t the positive turn in you get with some tyres. Some riders who prefer a more rounded tyre will appreciate that more gradual transition to the cornering edges though, so do bear this in mind. 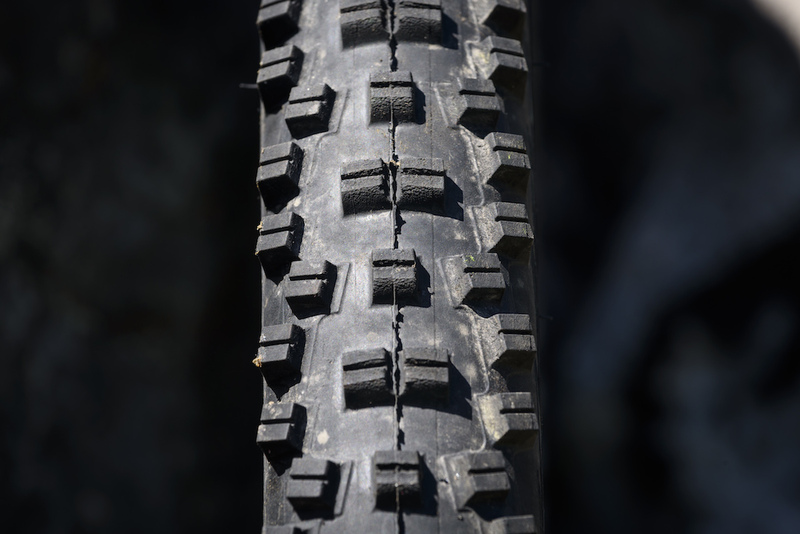 The Vigilante’s blocky tread pattern is best suited to soft loamy conditions. 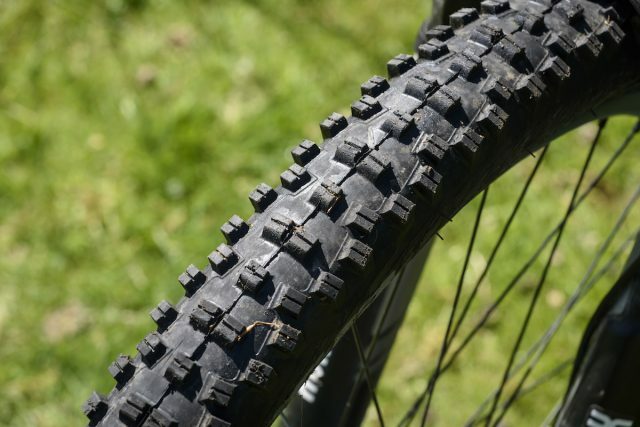 This tyre is neither quick nor suited to rock and hardpack trails. It does have good braking traction, and the High Grip rubber compound is suitably sticky for latching onto roots and hard edges. 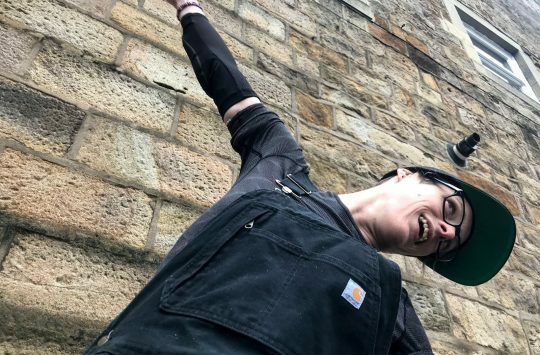 While climbing traction was excellent, the drag from the rear was unremitting and all that traction doesn’t necessarily translate to outstanding cornering or braking grip out back – the rear would randomly hook up in corners on the steeps, only to let go again just when we needed it to hold. Running the Fast Rolling compound out back would go some way to reduce this drag, but that would seriously reduce the amount of grip available, especially on wet rock. On the plus side, wear was minimal and the tyres have stood up very well to our abuse with the side knobs in particular looking particularly fresh. Compared to this testers benchmark of a Magic Mary 2.35in on the front and a High Roller 2 2.4in on the back for a solid mix of trail traction and fast pedalling between the technical sections, the Vigilante is a much more compromised tire at both ends for more aggressive high-speed riding – especially on challenging off-camber trails laced with rocks. If that sounds like your bag, then consider the huge 2.5in WTB Convict tyre, which is significantly bigger in volume. In comparison, the Vigilantes are clearly designed to excel in softer soil conditions (the North Americans call it ‘loam’), and in that environment they perform well. Durability with the TCS Tough casing is excellent, but it does make the Vigilante a weighty tyre. While the Vigilante is a robust and long lasting tyre, with good levels of grip on most trails except wet rock, there are other tyres that do a better job in specific conditions. In general, we’d recommend this one as a front tyre, and running something a little quicker in the back, such as WTB’s excellent Trail Boss tyre. 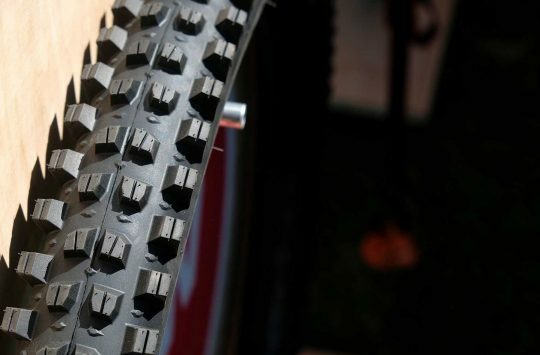 And if you’re more of into general trail riding and don’t typically tear open sidewalls and rip casings on a regular basis, consider the TCS Light casing that drops a hefty amount of weight out of the tyre to decrease rolling mass for zippier acceleration. One area that the Vigilantes are outstanding though, is value for money. They can be found for nearly half the price of some of the tyres on test, and while we found them to be lacking in some areas, they most certainly aren’t half as bad. Singletrack Issue 115 - Last Chance to Subscribe!